Dracaena sanderiana is a species of flowering plant in the family Asparagaceae, native to Central Africa. It was named after the German–English gardener Henry Frederick Conrad Sander (1847–1920). 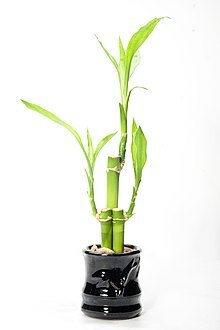 Keeping lucky bamboo inside houses and business places is believed to bring happiness and prosperity, and this belief has promoted sales of lucky bamboo shoots grown in decorative pots.The plant has become the most popular indoor plant in certain parts of India, where the plants are usually imported from China and Taiwan. Common names include Sander's dracaena, ribbon dracaena, lucky bamboo, curly bamboo, Chinese water bamboo, Goddess of Mercy's plant, Belgian evergreen, and ribbon plant. Although the word bamboo occurs in several of this plant's common names, D. sanderiana is of an entirely different taxonomic order from true bamboos – though it is worth noting that this plant and true bamboos both fall under the monocot clade. Despite several of its common names that suggest it is from China or Belgium, it is a native African species. Dracaena sanderiana is often confused with Dracaena braunii, a plant from coastal West Africa with flowers 5 times shorter than those of D. sanderiana. A perennial herb, reaching a height of 100 cm, the plant has slightly twisted leaves of grey-green colour, with a length of which is up to 23 cm. The stem is fleshy, which distinguishes it from bamboo. It requires bright, ventilated areas. It tolerates dry air and does not require constant spraying. A very tenacious plant, it is rather difficult to destroy it. Dracaena sanderiana and its related varieties are popular houseplants. It is a suitable plant in a confined space, and the most suitable place is a scattered light or semi-shade site because direct sunlight causes yellowing and burning of leaves. Temperatures range from 15°C to 22°C. It requires average warmth, good illumination, regular watering and water spray. If planted in the ground, it loses its bamboo-like look and it would fill with a leaf-like shape like other dragon trees. It is multiplied by cutting a part of the stem just above the eye. Cuttings can be made year round. Plant with multiple, woven stems. ^ a b "Dracaena sanderiana". World Checklist of Selected Plant Families. Royal Botanic Gardens, Kew. Retrieved 2018-03-04. ^ a b c Mustafah, K.K. (8 June 2010). "Lucky bamboo". The Hindu Business Line. Retrieved 5 August 2013. ^ Hugh T. W. Tan and Xingli Giam (2008). Plant Magic: Auspicious and Inauspicious Plants from Around the World. Marshall Cavendish Editions. p. 62. ISBN 9789812614278. This page was last edited on 30 March 2019, at 21:03 (UTC).